We’re totally believers that if you find the person you want to spend the rest of your life with, you shouldn’t let anything stop you from sharing your love. 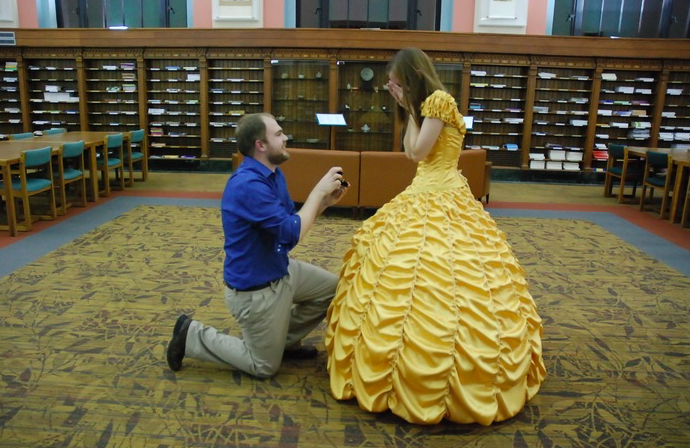 Which is why we’re getting a little teary-eyed with this story of a guy who loved his girlfriend so much, he went above, beyond and then some during his Beauty and the Beast-themed proposal. Every detail was executed to pure perfection for someone who loves the Disney classic and there is so much love in the air it has put a smile on our face for the rest of the day. Imgur user jel2930 posted a series of photos that details his super planned out wedding proposal that starts with recreating that famous yellow dress from Beauty and the Beast. “This is Cara, my best friend and partner in crime. She grew up admiring Belle from Beauty and the Beast. Wanting to recreate the famous scene, I decided to make her the dress to coincide with my proposal." Yes — he made it from scratch and it turned out so incredible, we wish we could try it on. When Cara tries on the dress, it fits like a glove and right there in the library, which couldn’t be a more perfect location, he got down on one knee and asked his Belle to marry him. “Wait… does this make me the beast? ah well,” he jokes and shares some snaps of his fiancé twirling in her Belle dress. We’re seriously in love with love stories like this and we’re so happy for these two.